As we are swamped nowadays with merely negative criticism (indeed, in merely enthusiastic indignation), I find myself agreeing with him, both in that I would rather read about those artists or ideas that people truly love, and that I would rather write about those who have influenced me. Life is short enough, and it seems a better gift to posterity (or just for a stranger reading this a few days from now) to talk about not what I hate and want to tear down, but what I love and find most meaningful. Eliot remains both of these. This is how I feel about Eliot–but the reasons for this feeling are entirely personal. For many writers, the discovery in youth of one’s first literary heroes can sometimes lead to the dogmatic view that they should be so important for everyone. However, the more I come back to Eliot, the more I discover and rediscover him, the more I continue my dialogue with him, the more I see how personal my reactions to him have been. He has even been loosed from the “Modernist” movement I so long associated him with. A recent and wonderful BBC documentary about Eliot suggests that Modernism actually began with the third line of Eliot’s “The Love Song of J. Aflred Prufrock” (where the evening spread out against the sky is compared to “a patient etherised upon a table”). Years ago, such a statement would have fired and inspired me–and it may do the job of inspiring young writers now. But Eliot’s importance for me has nothing to do with Modernism, or other writers he knew, or anything of the sort. It’s something else–not something better, just something different. For reasons I can’t decipher, I latched onto him and not a handful of other authors I was being introduced to at the time, so that in the sixteen years since I first truly read him, my interests since then (in religion, literature, and history) have become a kind of chicken-and-egg proposition–was this or that begun with my exposure to Eliot, or just informed and helped along with my exposure to Eliot? It’s all tangled. Like few other authors and poems and essays, I am wrapped in Eliot’s poetry and life story, and his poetry is wrapped in all that I am. Watching this documentary again, I realized how lucky I was for that to have been my introduction to Eliot. Only vaguely chronological, it actually begins and ends with Eliot’s readings from Four Quartets, and while in between we are given the skim over of his life, it’s not the narrative that matters, so much as the flashes, the fragments: the anecdotes of a young man from St. Louis going to Harvard, spending some of his nervous and virginal and self-conscious youth in Paris, and ending up in London and marrying his first wife. It was about a young man from America who became an old and venerated man in England, an England both urban and rural, the scenes filmed in his ancestral village of East Coker eliciting exactly the kind of nostalgia I’ve always felt for that country, for both the age of its cities and the beauty of its landscapes, beauty beyond any sense of age or time. Besides all this, the scholars and talking-heads shown in the program speak as if to a group of Eliot experts, alluding to Eliot’s allusions and references as if everybody knows about them. This instilled in me not a pompous sense of wanting to be in on the mystery of just another clique, but of moving into a world whose of true meaning, a world worth experiencing. Of Jules Laforgue, for instance, I can say that he was the first to teach me how to speak, to teach me the poetic possibilities of my own idiom and speech. […] I think that from Baudelaire I learned first, a precedent for the poetical possibilities, never developed by any poet writing in my own language, of the more sordid aspects of the modern metropolis, of the possibility of the fusion between the sordidly realistic and the phantasmagoric, the possibility of the juxtaposition of the matter-of-fact and the fantastic. From him, as from Laforgue, I learned that the sort of material I had, the sort of experience that an adolescent had had, in an industrial city in America, could be the material for poetry; and that the source of new poetry might be found in what had been regarded hitherto as the impossible, the sterile, the intractably unpoetic. That, in fact, the business of the poet was to make poetry out of the unpoetical; that the poet, in fact, was committed by his profession to turn the unpoetical into poetry. What also helped was that this, and this alone, could constitute poetry. A scene, a suggestion–indeed, a prelude. Always impressed (still impressed!) by larger visions, it was something for me to immediately discover, beyond the churchyards and the flowering pronouncements of what we were shown of the Romantics, and beyond the full-scale tragedies of Shakespeare and the impenetrability of the Metaphysical poets, that a simple scene, and one I felt I knew very well, could be a poem. And it need not rhyme, either, at least consistently–I have always loved Eliot’s sudden rhymes. But almost immediately, there was an unfamiliar Eliot, one that hinted at an unfamiliar version of myself, waiting to be found. This is the great worth of art, for me: that Eliot was, on the one hand, able to appear recognizable to me in some ways, and in others entirely unknown–but in that unknown, he was able to activate within me interests and aspirations I had always held, but had not found a way to seek out, never yet found a guide for, never been able to articulate. Eliot has always been tagged a “difficult” poet, but he never appeared this way to me, even at seventeen and seeing the above words for the first time and not knowing what half of them meant. A “difficult” writer for me is one whose initial meaning or method is hard to discern, but whose meaning and method, I gather by instinct (again, a personal reaction not requiring argument), won’t be worth the trouble. With few exceptions, Eliot has always been worth the effort, and has never been trouble. His ability to pull from Elizabethan tragedy, Hindu scripture, all of English poetry, Arthurian romances, philosophy, popular music, and the rest, seems for many to be an excuse for scholarship and source-hunting; yet for me these aren’t signs of great learning or education, but simply of great feeling, and the great use that Eliot was able to put his feelings to, so that something as useful as B. C. Southam’s Guide to the Selected Poems is wonderful primarily for the light it shines on how vast a space Eliot was able to feel, drawing on the emotions of all of history to illuminate his own contemporary time, in the process making his own contemporary moment as timeless as the works he drew from. This was a piece of music Eliot himself said he’d played over and over while writing the Quartets, and it is one I’m playing over and over while writing this small essay, and it has remained one of my favorite pieces of music ever since. It is hard not to associate its nostalgic and mournful bittersweetness to my own transition from youth to adulthood, and when my wife and I were able to see this quartet performed live at the Metropolitan Museum in 2008, I had the thought that if Eliot did nothing else, his introduction of this Beethoven quartet to me, at that time in my life, was been more than enough. Many of these reflections came later. But from the first viewing of the documentary (which I asked my teacher to borrow to watch again), I was hooked. I ordered his Collected Poems 1909-1962 soon after (reading “The Hollow Men” aloud to my mother on the way home from the mall), as well as a small yellow paperback edition of The Waste Land (the seventy-fifth anniversary edition with a long closing essay by Christopher Ricks–an essay I reread as much as the poem, an essay which was itself my introduction to just the kind of scholarship I love). I still remember sitting with the latter in a Perkins restaurant in Painesville, Ohio, and there the yellow cover was closer to gold, the entire thing feeling important and treasured already, and (despite its worldwide fame) some kind of secret only I knew of. When I entered college a few months later and went through orientation, it’s not the orientation I remember (or any of the places I went to in the next few years where I had a moment to read), but that yellow paperback in my pocket, and how I plucked it out of my coat every moment I could. 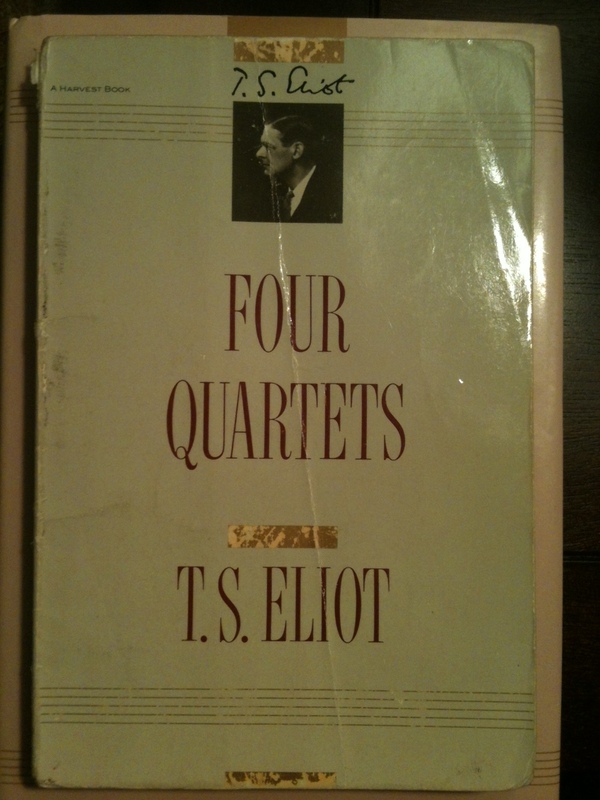 Later, after Four Quartets became the pinnacle of what poetry is for me, it was a standalone edition of the Quartets that I always carried with me. There are innumerable lines from the Quartets that constantly fill me, and they all swim together and gather up what I’ve written about above: the familiar and the unfamiliar, the experiences of youth and old age, the urban and rural, the religious and visionary, the limitations of words but the value of trying, the meditative and philosophical and prayerful. Eliot writes about writing quite a bit in Four Quartets, mostly about the failure of writing (“The poetry does not matter”); he also writes about music and timelessness–and these passage drew me to him immediately, and I recognized my own experience in his words. There is also the matter of old age, and the cliché that experience and old age somehow equal wisdom; or, that “writing poetry” suggests some kind of wisdom, too. These are all things that Eliot refutes. If the “poetry does not matter,” then what does? 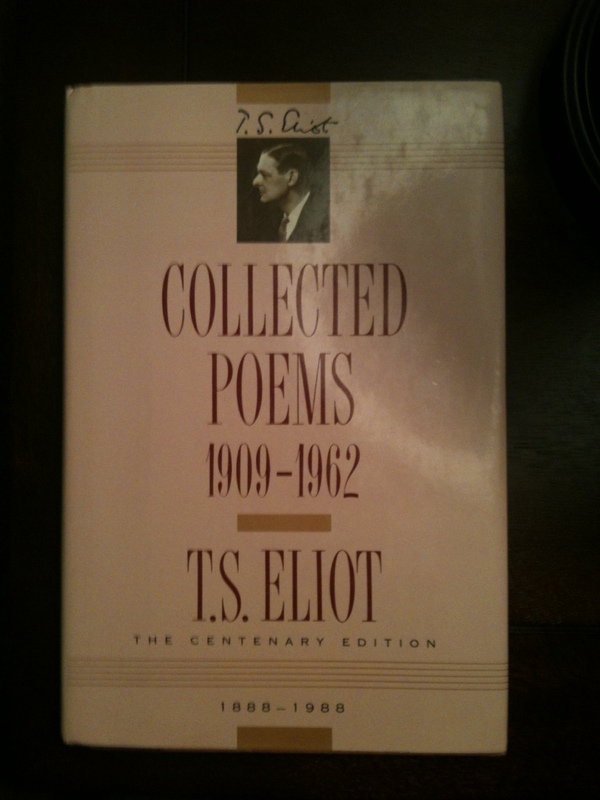 Eliot, then, represents a handful of firsts for me: the first Collected poems I ever bought, the first letters of a poet, the first biography. And while there are other poets who sometimes strike me as hard as he does (Whitman, Stevens, Jeffers, Dante, the anonymous authors of various myths, from Ireland to India), no one fills me with as much affection as Eliot. He was there, as it were, in my beginning. Even when I first moved away from home, and found myself in a small apartment in Macon, Georgia, I didn’t feel as if I’d truly “begun” this new phase in my life until I found, with nearly breathless joy, a VHS copy of that Voices and Visions documentary on Eliot at the library, and watched it for the first time in six years. 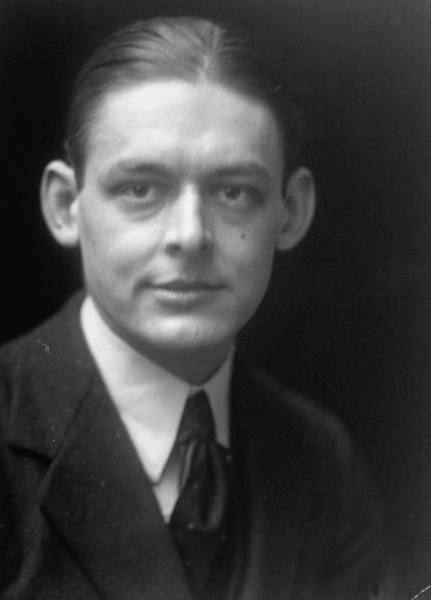 On a recent trip to London, where my wife and I were able to find two of his early London addresses, as well as the church where he was baptized in 1927 and where he worshiped for the rest of his life, I realized that the merely-urban nature of his poetry, and the merely social and sexual anxieties of “Prufrock” and other no longer draw me at all, and that what is left now is the entirety of the Quartets, some of The Waste Land and Ash Wednesday, and then only a personal impression, only a series of fragments, only a series of anecdotes, a feeling from what I know of his biography, and how that biography is tangled up in my own, and in my own growing awareness from early youth of what writing, and religion, might be. Even his plays, much else of his early poetry, and the controversy surrounding his “dirty” poems and the horrid expression of his occasional anti-Semitism–these have all dropped away, and the words of his I’ve depended upon have become as much mine as his. What all this isn’t, then, is an aesthetic statement. Just as poets or writers say that a poem or a novel they wrote actually chose them, I think the same way about our relationship with certain writers, certain movies, certain (supposedly) chance encounters with nature or any place that speaks immediately in ways nothing ever has before. All of this moves me greatly, but does not move me to make any certain statements about art or culture, or about aesthetics or poetic tradition and poetic standing, about poetic ranking or rankling. There is no fight to pick here. Eliot is my old friend, but I can’t expect that to be the case for anyone else. 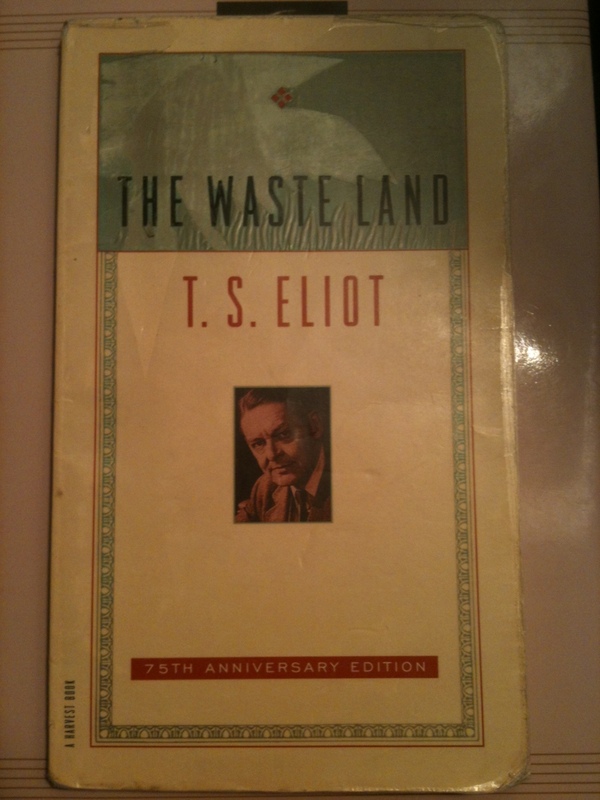 It amuses me that even I took my reaction to Eliot the wrong way at first (and for so long), and tried to replicate my experience with his poems and letters and biography with the poems and letters and biographies of many others, all to my own detriment, and all to a great waste of time. Eliot wrote of a “lifetime burning in every moment,” and the encounter with poetry and art constitutes such an experience for many people–it’s the kind of experience, like romantic love, that we all seek. Yet in order to keep that experience going, or to reignite or legitimate it, in between those ecstatic moments “where here and now cease to matter,” lovers of poetry and art twist themselves into pretzels trying to make sense of the moment, to intellectualize it, to categorize everything, and end up arguing about one’s love of this author against someone else’s love of another author. Yet in glancing back at my time with Eliot (nearly half my life, now), it is wonderful to see how central he is to me, but also how personal that reaction is, how mysterious. I cannot pretend to speak objectively about Eliot or anybody else, especially since an attempt to do so would take away from time better spent rereading them. I read Dante only with a prose translation beside the text. Forty years ago I began to puzzle out the Divine Comedy in this way; and when I thought I had grasped the meaning of a passage which especially delighted me, I committed it to memory; so that, for some years, I was able to recite a large part of one canto or another to myself, lying in bed or on a railway journey. Heaven knows what it would have sounded like, had I recited it aloud; but it was by this means that I steeped myself in Dante’s poetry. For me, these lines bring to mind my freshman year in college, which again was remarkable not for the classes but for the northeast Ohio autumns I still adore, and how I remember driving my old Subaru with the windows down, going over traintracks and around the suburbs nearby, listening to tapes of Eliot reading The Waste Land and Four Quartets. This was my way of memorizing my early guide, even and especially when the meaning was unclear and only the rhythm carried me. And when I was alone in the quiet on the campus, or elsewhere, and I recited a great deal of those lines to myself, those moments mean more to me than I can say. 1 To the Criticize the Critic and Other Writings, “To Criticize the Critic,” 18, 20. In addition, as early as 1929 Eliot said his statement on “impersonality” was a “bluff” (Letter to E. M. Forster, August 10, 1929; quoted in Lyndall Gordon’s T. S. Eliot: An Imperfect Life, 484), that he expressed himself “badly, or that I had only an adolescent grasp of that idea” (On Poetry and Poets, “Yeats,” 255), and in his preface to the 1964 edition (a year before his death) of The Use of Poetry & The Use of Criticism, he refers to “Tradition and the Individual Talent” as “juvenile,” and goes on to say that part of the reason to republish the present book is in the hope that future editors of essays-anthologies might choose something other than that essay. 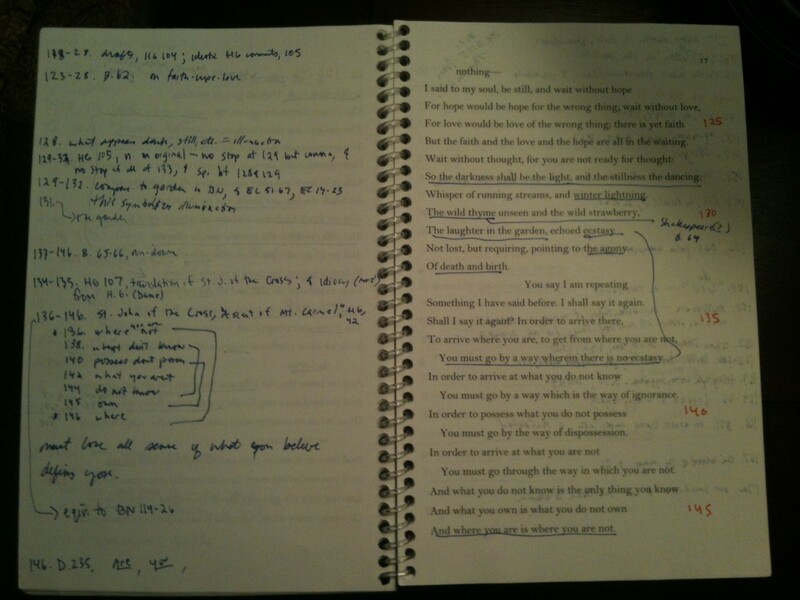 4 To the Criticize the Critic and Other Writings, “What Dante Means to Me,” 126. To the Criticize the Critic and Other Writings, “What Dante Means to Me,” 125.